Welcome to the world of the Lesser Scaup! The Lesser Scaup is a very interesting species of diving duck that is found primarily in North America and is actually one of the most populous ducks in the area. Lesser Scaup, also known as Aythya affinis, are medium sized birds that prefer freshwater for their daily living, as opposed to saltwater which is the preference of their closest relation, the Greater Sca up(Aythya marila). 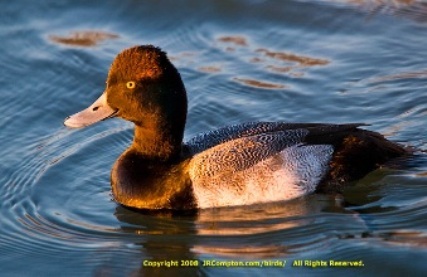 Both genders of Lesser Scaup have yellow eyes but other than this, differ greatly in appearance. The male Lesser Scaup is mostly black, with a white belly and sides as well as grayish-black lined feathers along their backs. Males also, when seen at the right angle, have a purple iridescence along the sides of their head and neck. Females, on the other hand, can be identified by their primarily brown coloring, aside from small areas of white located at the base of their bills and bellies.